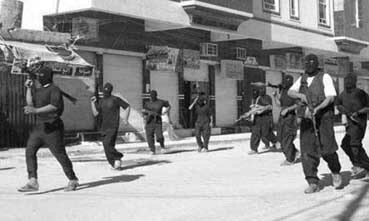 AMERICAN FORCES are being pounded across Iraq as the partisans surge forward in waves of attacks and bombings that reflect the increasingly sophisticated tactics and weapons of the guerrilla movement today. Ten US soldiers were killed in action this week bringing the number of imperialist troops killed this month to 122, of which 117 were American – making May the deadliest month for American forces so far this year. Resistance commandos blew up a major oil well north-west of the northern city of Kirkuk in a dawn attack on 24th May and the fires are still blazing. No casualties were reported but the puppet regime says it could take “several weeks” to put the fire out. Fighting continues in Mosul, which was bombed by US warplanes on Monday and an American helicopter gunship was shot down in the eastern Diyala province that borders Iran. The partisans then ambushed the rapid-response team that was rushing to rescue the crew, killing six with a barrage of roadside bombs. Back in Baghdad the heavily fortified “Green Zone” that houses US military HQ and the puppet government is coming under partisan Grad missile attacks, while other units rocketed US intelligence HQ at Saddam International Airport and blew up an important bridge in the west of the capital. Meanwhile American and puppet regime forces are scouring the city in search of five Britons – four mercenaries and a “finance expert” – kidnapped by men wearing puppet police uniforms in a raid on the Finance Ministry building on Tuesday. Though one puppet minister believes supporters of maverick Shia cleric Muqtada al Sadr are holding the captives, this has been categorically denied by al Sadr’s Mahdi Army. All of this has overshadowed the American-Iranian talks that took place in Baghdad on Monday under a veil of secrecy. The four- hour meeting between the Iranian and American ambassadors to the puppet regime was ostentatiously low-key for first bilateral public talks between the two countries in almost 30 years. But it has been roundly condemned by the underground Arab Socialist Renaissance Party (Baath) that was locked in a bloody conflict with Iran during the 1980s during Saddam Hussein’s days. The talks, sponsored by the puppet regime which has close relations with Iran, revolved exclusively around the future of Iraq. The Iranians called for an end to the occupation and the “immoral acts of the occupiers”. But they also condemned the “rampant insecurity caused by terrorists” and said they were duty bound to fully support the puppet regime, which they called “the democratic government of Iraq”. The Baath said that this meeting was “an official and frank US admission for the first time that Iran is the US main partner into occupying Iraq from the beginning and until this very moment; and that both the United States and Iran, regardless of their differences on how to share the booty in Iraq and in the region, will always agree on Iraq’s future and especially in wiping out Iraq’s Arab identity”. The Baath called on the resistance movements to end their squabbling, warning that “provocative and narrow minded” elements played into the hands of the Americans and Iranians who were seeking to drive a wedge into the resistance ranks to detroy it with its own tools. THE POLITICAL PAGES of the press this week have been full of plans and proposals by the skip-load from those who are jostling for top positions in government – and two on the verge of retirement who seek to leave an indelible mark. They include incoming Labour leader Gordon Brown, the six candidates for the deputy leadership of the Labour Party and Tory leader David Cameron – and, in the second category, Tony Blair and Home Secretary John Reid. The proposals cover five main areas of public concern: the NHS, education, housing, the environment and anti-terrorism. Blair and Reid – the retiring two who have nothing to lose – have proposed increasing police powers in yet another ratcheting up of the “war on terror”. Effectively they want to bring back the heinous “sus” laws. It is alarming how similar the proposals from different sources are. There seems to be a consensus from most – including Gordon Brown – that the NHS has been seriously mismanaged over the last two years. Both Labour and Tory leaders have separately developed plans to bring the private sector more into education by making the better equipped and staffed private schools lend teachers and laboratory space to their neighbouring state schools. On the environment there is a near consensus that a new generation of nuclear power stations is inevitable. There are calls for more carbon trading. This means rich countries bribing the governments of poor countries to stay underdeveloped and uncompetitive so the rich can carry on polluting the planet. Among the hopefuls for the deputy Labour leadership there is a sudden rediscovery of the benefits of council housing. Clearly this is what their marketing advisers have told them the public want to hear. Some of them may actually mean it but it is evidence that the opportunists among them can be pushed by working class pressure. Unfortunately the working class is not putting the pressure it could and should. For a start, it is still fighting with both hands tied behind its back because of the anti-union laws introduced in the Thatcher years. None of the new proposals include scrapping these laws. Secondly there has been a set-back with the failure of John McDonnell to get the support of enough MPs to mount a challenge to Brown’s accession to the Labour leadership. The rank and file of the party and the unions were denied a say in the succession and denied a proper debate about policies and many are disappointed – feeling powerless and marginalised. But we must remember that the front line of the class struggle cuts right through the Labour Party. There’s no way the ruling class would hold back from trying to corrupt and sabotage that party from within, knowing how dangerous it could be for them if they did not. MPs are the end product of the Labour Party machine selection process in which most of them are forced to sell their souls before they get so much as a sniff at a candidacy. No wonder so many of them are so weak. And it is no wonder that so many working class people, especially the young, feel totally powerless and alienated from political struggles. There’s a whole generation who have no memory of the trade union strength and successes of the 1970s, let alone 1945. The weak, right-wing trade union and Labour leaders got where they are because working class people either voted for them or failed to fight against them. The fringe left parties like Respect, the Socialist Labour Party and so on are deluded if they think the working class are just waiting for them to proclaim left policies to capture a mass vote. The miserable votes they get in elections bear witness to this. But we cannot pass a vote of no confidence in the working class and elect a new one; we must engage with the one that exists. No other force except a united mobilised working class can ever overthrow capitalism and bring socialism. Achieving this is a dialectical process – much of the time things are slow and discouraging, as in Britain at the moment. But under crisis conditions things can change rapidly – as in the General Strike of 1926 or the miners’ strike of 1984 – and working class solidarity, flair for organisation and originality in tactics arise overnight. It will happen; it’s just a matter of time – and confidence.